Oh joy- the start of weekly visits!?! 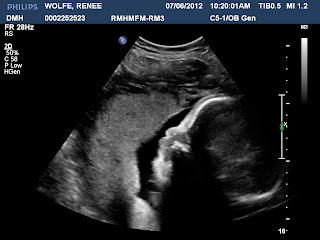 We had another anatomy scan a little over a week ago at Riverside- slacking a little... I wanted to post pictures of our little guy, so I had to wait until I got them on the computer. We took Eli along for the ride with hopes Ethan would not be hiding this time. I was more nervous at this appointment then I had ever been in awhile. 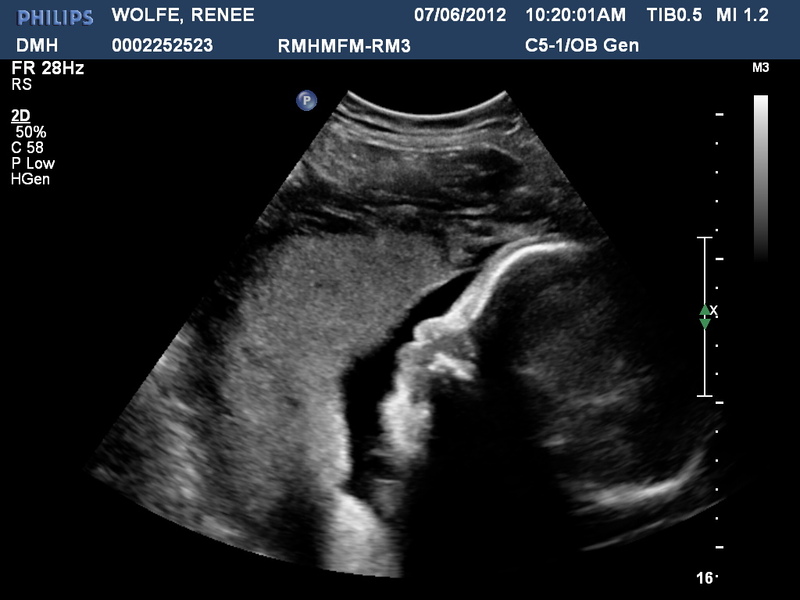 I was worried about everything especially his stomach measuring smaller and increased amniotic fluid. Thankfully uor usual u/s tech, Dawn was there to make me more at ease. 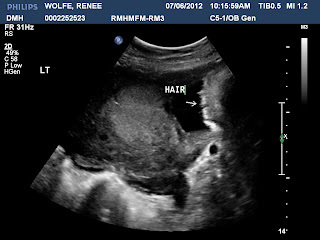 What is really nice is they have a flat screen TV that will show the ultrasound as its being performed. Immediately, Eli was like WHOA he has a big head!! I couldn't believe he made that out. We saw he is getting some hair, it looks a little darker but still hard to tell. He was head down and his face was pointed towards my spine. I literally had to basically get up on my hands and knees to attempt to get a picture of his face. She was able to capture it and he is as cute as ever. I wish I has a video of Eli. He couldn't believe it and was so excited to see his little brother. Our Dr came in and shared great news, my fluid levels were down to normal and his stomach was measuring right on track. 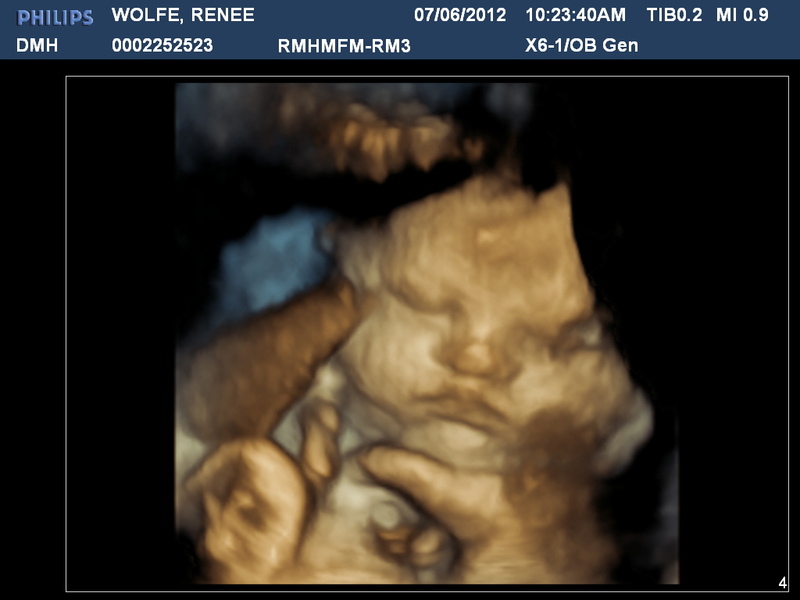 He is up to 4lb12oz. I believe he nearly gained 3 lbs in a month!!! I will have my last anatomy scan on August 3rd. I will start weekly visits July 23rd, my last appointment with Barnhart, then the following week will be at Riverside from then on.... It just seems crazy how quickly everything has gone. I'm almost done organizing Ethan's room. Just working on finishing additions and minor touches. My mom and I went through Eli's baby clothes and they are washed and put away. Eli is already such a huge help. He kisses and hugs my stomach multiple times throughout the day. Actually he tells Ethan good morning and good night before me! He talks to him like he knows who he really knows him. It's the times like this I wish I could freeze time.